#7 Master Flash Black EPDM Pipe Flashing Boot. 14 X 14 inch Square Base. Fits 5.5 To 11.5 inch Pipes. Price/each. 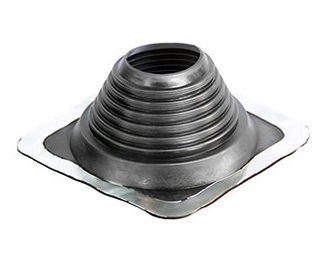 Flexible Base Design: Sealing tightly with sealant and almost any type of fastener, the flexible base is virtually compatible with any roofing material -- metal, plastic, asphalt, tile, rubber membrane, and more. Uniform Plumbing Code (UPC) Listed: Master Flash was used to create a new engineering standard for profiled roofing by the International Association of Plumbing and Mechanical Officials (for the Uniform Plumbing Code). Environment Control: Master Flash provides a permanent seal that controls gaseous or liquid environments to eliminate leakage and odor contamination. Corrosion-Resistant Base: Master Flash base is made of heavy-duty aluminum alloy for flexibility and corrosion resistance. Manufacture provides 20 year limited warranty. #7 BLACK SILICONE Rubber Flashing Boot, 14.1 x 14.1 Inch Square-Base, 5-3/8 High, 5 inch Open Top. Fits 6 to 11 inch OD Pipes/Rods (152 - 280mm). Price/Each.